The following post is written as part of round 5 of the Library Day in the Life project. 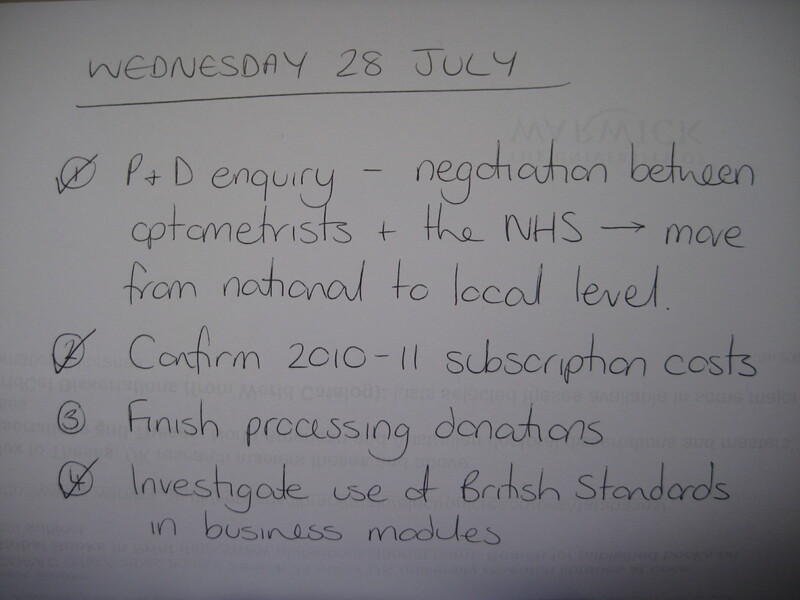 First thing this morning I had a meeting with the student from earlier in the week who is researching the relationship between optometrists and the NHS. We looked at search strategies, identified useful journals and databases and talked about applying for funding. After this I spent a little time tidying the papers strewn across my desk. I always like to leave at the end of the week with a tidy desk, I find it makes Monday morning much more bearable. 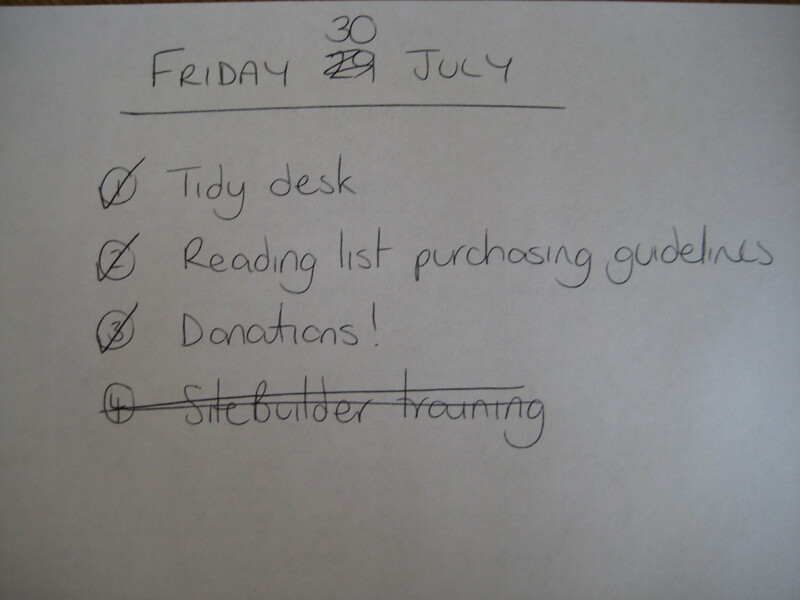 Something I’ve been sitting on for a few weeks is writing a set of reading list guidelines for our procurement team. Previously the subject team had processed all reading lists and put in all book orders to procurement individually. This year this has been centralised through a newly created reading lists team. The idea is that they will process all the lists and follow guidelines set by the subject librarians for purchasing copies of core and additional readings. I submitted my guidelines today. Straight after lunch I headed down to the basement with the library’s iPad to work through the last two shelves of business donations. It feels good to have finally cleared the backlog. Over coffee I settled down to read CILIP’s Defining Our Professional Future Report. I finished the day, and the week, with an interesting enquiry about oil companies and crisis management. Today I spent a lot of time writing and responding to emails and consequently I didn’t get round to my donations again. Most of the emails were about setting up or feeding back from meetings. 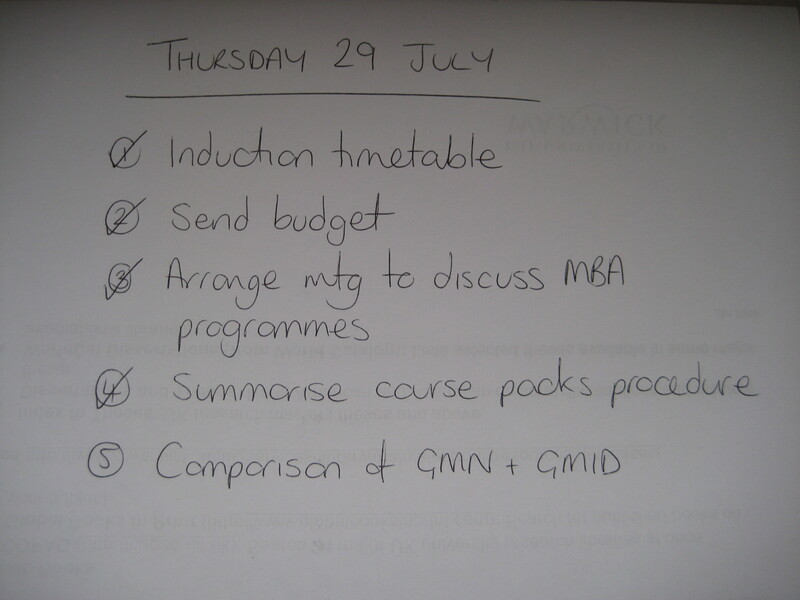 Added into the mix was finalising my induction timetable with the programme managers. I think I’ve just about managed to fit everyone into the slots they wanted, get the rooms booked and still build in a lunch break for myself. On top of this there were the usual daily enquiries about access to electronic resources and help with finding information on specific companies and/or industries. I had two Datastream enquiries today. 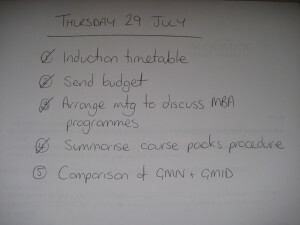 One was an ongoing enquiry for a student who is replicating a study done by a previous student at the business school. She is trying to build up the exact dataset that they used – after some tweaking I think we’re finally done now. The other was a basic introduction; the student got the hang of things quickly and was off making her own requests in no time. One thing that I will be carrying over to tomorrow is the comparison of Mintel’s Global Market Navigator with Euromonitor’s Global Market Information Database. Evening soundtrack: A Genius Playlist – Singer/Songwriter Mix including Joni Mitchell, Regina Spektor and Damien Rice. Today was all about suppliers and enquiries. I spent the first hour on the phone chasing up subscription costs for the next financial year to put into my budget. Mid-morning I had a meeting with a supplier who stopped by to show me some developments to their products and talk about possibilities for expanding the content in our subscription. No sooner was I back at my desk than I was called to another meeting with a database rep to talk about how we could market their product, which up until now has mainly been used by manufacturing and engineering, to the business school. 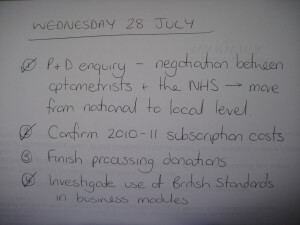 As you will see an enquiry made it on to my to do list today. Yesterday I had an email from a distance learning student who is planning to write a dissertation on the relationship between ophthalmologists and the NHS. I have arranged to meet her on Friday morning to discuss the range of resources she can use for her research but first I needed to do some research of my own. The first thing I learnt was how to correctly spell ophthalomologist. One thing from my to do list that didn’t get done today was finishing the process of deciding which donations to add to stock. When I arrived in this job I inherited two bays (around 20 shelves) of donations in my subject area. Last week I started going through them to see which I want to add to stock and which can be passed on. I’m down to the last two shelves but just can’t seem to fit them into my schedule. I stayed on a little after work to attempt to write a pitch to publicise the Library Day in the Life project in the UK media. 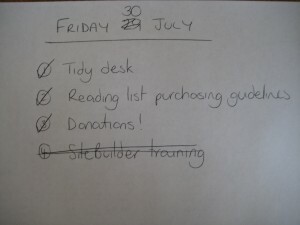 With the help of @Girlinthe we’ve put something together which we plan to send to the Guardian and Radio 4 later today.